Australian Men's Fitness is your personal trainer, dietician, coach and training partner all rolled into one. It’s honest, to-the-point, motivating, informative and, in typical Aussie-style, peppered with wit and humour throughout. You’ll find everything you need to know to achieve your own PB - health and nutrition, the latest fitness trends, travel and adrenaline adventures, relationships, sport, cars, lifestyle and everything in between. This is a magazine for men who want solid information and advice, not counseling; who want to know how to pack on muscle, get that six-pack, lose fat, win the race, get the girl, snare the dream job and still achieve work-life balance and be home in time for the nightly news. All in a day’s work. Australian Men's Fitness is the complete handbook for the average Australian man who wants to be fit, strong, healthy and happy. Written in an honest style with a typically Aussie wit, the magazine is personal trainer, dietician, coach and training partner rolled into one. It touches on health issues, explores new fitness trends and discovers new adrenaline adventures. It inspires, motivates, educates and entertains. 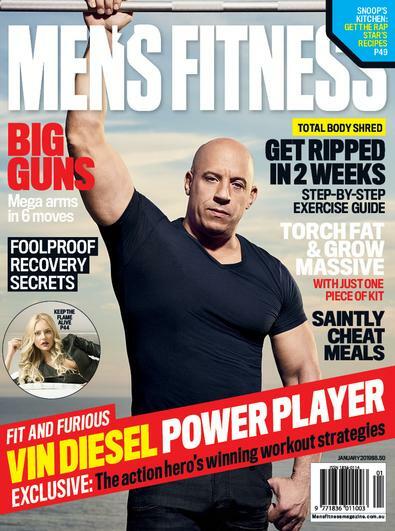 Men's Fitness is for men who want solid information and advice – not counselling. Using the resources of Australia’s top health and fitness experts, the magazine will show you how to pack on muscle, lose fat, win the race, get the girl, snare the dream job and be home in time for the nightly news. It's a magazine for Australian men who want to – and will eventually – reach their personal best. It&apos;s an easy read and gives simple tips on how to change small things about our bodies.